September 11, 2001, I was annoyed at my wife, Mary. I was about to take a shower, yelling from the bathroom, “Honey, there is no water!” She had forgotten to pay the bill. In the small Florida town where we live, I would have to get dressed and drive two miles to the water company. Then, wait for the leisurely paced workers to get around to turning my water back on. How annoying. What a pain. That was the biggest issue of my day that morning. 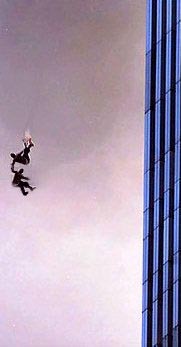 As the nightmare of 9/11 unfolded, several of my fellow Americans who simply showed up for work were faced with a horrific decision; whether to be consumed in the inferno or jump to their deaths from the towers. Many became “the jumpers”. Who was responsible for putting my fellow Americans in such an unimaginable horrific position? Al Qaeda. That same day, American Todd Beamer on board flight UA93 thought to call his wife Lisa, but did not want to worry her. He called GTE supervisor Lisa Jefferson to say that their plane had been hijacked. Beamer lead passengers in voting to storm the cockpit and take over the plane. Beamer instructed Jefferson, “If I don’t make it, please call my family and let them know how much I love them.” Jefferson heard Beamer’s voice, “Are you ready? Okay. Let’s roll!” Flight UA93 crashed in a field in Pennsylvania. Who were the hijackers? Al Qaeda. Well, why were both these guys vehemently opposed to President Bush attacking Saddam Hussein who on a single day gassed 5,000 of his own people? Over a few decades, Saddam used various gasses to kill 50,000 of his own people. Saddam used poison gas against his own people 50 times more than Assad. As for Kerry and Obama claiming that we can not risk America being perceived as a paper tiger, I say, “too late”. The 2001 September 11th attack was the result of past wimpy responses to terrorism by a Democrat president. Obama has merely continued the Democrat’s weak blame-America-first tradition. Before unpacking his bags upon his arrival in the White House, Obama went on his world apologize-for-America-tour. What has been our paper tiger president’s forceful response to terrorism? Pretend it does not exist. President Obama’s relentless efforts to protect his false narrative that Al Qaeda is on the run continues to have devastating consequences for Americans. The Fort Hood shooting was a Jihadist mass murder; unquestionably proven to be a terrorist attack. Coldly, the Obama Administration stands firm in classifying it as “work place violence” which denies the victims combat benefits. Also, while in prison, Nidal Hasan, the shooter received $270,000 from the U.S. Government while his victims had to pay their own medical bills. Finally, after 11 months the Obama Administration has charged the first suspects in connection with the Benghazi terror attack. Learning how to build a bomb in an Al Qaeda magazine, Dzhohar Tsarnaev expressed his extremist Islamist beliefs by killing 8 year old Martin Richard, Krystle Campbell and Lu Lingzi; injuring over 260, at least 16 suffered severed limbs. And yet, the Obama Administration rushed to Mirandize Dzhokhar, the surviving Boston bomber. Remarkably, Kerry has even opened the door to possible deployment of U.S. troops to Syria. Can you imagine our air force and troops providing military might for Al Qaeda?